Students in Conestoga’s Women in Skilled Trades (WIST) certificate program received an unexpected surprise on December 8 when construction magnate Mandy Rennehan, CEO and founder of Frescho, attended class at the Waterloo campus to deliver some holiday cheer. Rennehan presented each student with a $500 cheque on behalf of Freshco to help subsidize their living expenses. Freshco founder and CEO Mandy Rennehan personally delivered a holiday surprise for each of Conestoga’s Women in Skilled Trades students at the Waterloo campus on December 8. The gifts were part of a new partnership agreement between Freshco and Conestoga. WIST students will receive another $500 in February and Freshco will direct additional support to Conestoga’s Trades & Apprenticeship programs over a three-year period. Freshco is a unique, trend-setting retail construction company that provides 24/7 on-call retail maintenance across Canada and the eastern United States for high-end international brands such as Nike, Apple and Lululemon. In June, Profit ranked Rennehan 20th on its W100 list which recognizes the top female entrepreneurs in the country. She was also a 2016 finalist for the EY Entrepreneur of the Year. In its December 2016 issue, Chatelaine profiled Rennehan for her work as a trailblazer in the Canadian construction industry and her efforts to empower women to join the trades. 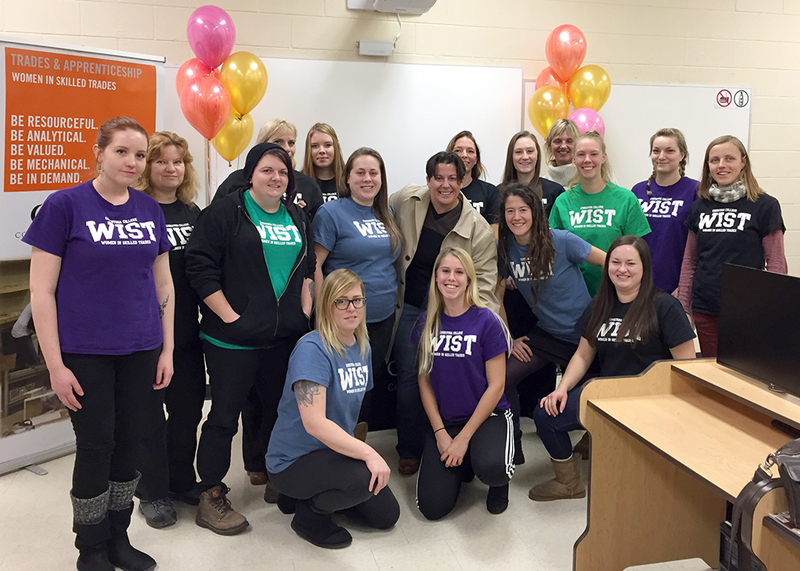 In addition to Freshco’s financial support, Rennehan has provided mentorship to WIST students and will deliver a keynote address at Conestoga’s 2017 Jill of all Trades - an annual day-long event for 200 young women in grades nine to 12 to introduce them to career opportunities in the trades. Freshco will also be involved in the college’s 2017 TNT Day which will provide hands-on activities for girls in grades seven to 10 related to different careers in the construction, industrial, motive power, engineering and architecture sectors. “I built Freshco based on my roots from the east coast, ambition, fun and respect for the integrity of individuals that, under normal circumstances, wouldn’t have been noticed or had the opportunity. Every person that works with me at Freshco shares in these principles of business and humanity so we are ecstatic to partner with Conestoga and the Women in Skilled Trades program and spin this talent out of control in an ever-evolving non-gender industry,” said Rennehan. The Women in Skilled Trades General Carpenter Pre-Apprenticeship program is offered to qualified students free of charge thanks to provincial funding from the Ontario Women’s Directorate. The 34-week program provides students with 26 weeks of in-class practical theory and hands-on experience, which is designed to help them secure and succeed in a paid eight-week work placement. Completion of the program equips students with the skills and knowledge to pursue opportunities and careers in the skilled trades and helps address the projected shortage of skilled trades workers in the province over the next 10 years. Conestoga is a provincial leader in the delivery of apprenticeship training and provides pathways to success through pre-apprenticeship and foundational programs in a variety of trades areas for students to develop their skills and knowledge. The School of Trades & Apprenticeship delivers a comprehensive array of skilled trades programs through campuses and training centres in Kitchener, Cambridge, Waterloo, Guelph and Ingersoll.